School science animation "Coffee" : The animation contains nonvolatiles such as caffeine, it also details the stimulation effect of caffeine on the nervous system. Caffeine acts as a mild stimulant to the nervous system, blocking the neurotransmitter adenosine. 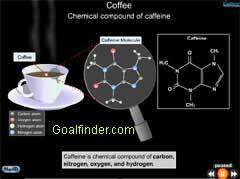 This animated chemistry topic gives in-depth information about coffee and its chemistry and is very useful for school teachers and students both. What is coffee made up of? How caffeine stimulates our nervous system? Caffeine acts as a mild stimulant to the nervous system, blocking the neurotransmitter adenosine and resulting in a feeling of well-being and alertness. It increases the heart rate, blood pressure, and urination and stimulates secretion of stomach acids; excessive intake can result in restlessness, insomnia, and heart irregularities. The effects of caffeine vary from person to person, as people excrete it at different rates. It is harmless when taken in small amount but when taken in excess it can cause nervousness, loss of sleep, headaches and digestive trouble.